Welcome to the very first episode of my five-day series called Next Level Your Biz! I’ve been thinking about what I do in my business and my mission for Soul CEO, and I’ve recognized that a lot of you are business owners and budding entrepreneurs. My mission with this series is to show the hell up for you guys and bring you the best stuff that I have when it comes to everything and anything that has to do with building the business and life you dream of. I’m sharing some next level stuff that I teach in my Mango Magic program and mastermind, so get ready for your business to blow up in the best way possible. Join me for episode one of my new series and discover how you can reconnect with your business if you’ve gotten lost along the way, or evaluate how you can go forward in a different direction if where you are isn’t right for you. Let’s take your business to the next level over the next five days together! If you’re all in and pumped like I am, I want you to get all the worksheets for every episode. You’ll basically enroll to get on my inner circle secret list to get these episodes and worksheets as they drop for the next five days! Why we need to reconnect with our why for being in business. What happens when you build a business without passion. One important question to ask yourself about your business. How to assess if you’re taking actions within your business that align with your desired results. Why structuring your business to get the results you want can feel uncomfortable. A powerful question to go back to every single day in the pursuit of the business you dream of. Hello. How are you? Oh my gosh, I am so freaking pumped you are here. Normally you don’t hear from a Monday but this is for a very special reason. So I’ve been thinking about what I do for women and my Soul CEO Podcast is all about women creating the lives and businesses that they truly want. I am all about this idea that you can truly have it all. And what I find is that as people expand their awareness of what’s possible for them and really start to believe at a whole new level, they really want to create a business or create something that they love in the world. And so I recognize and realize that a lot of you guys are business owners. Maybe you’ve just started a business, maybe you’re three years into business, 10 years into business. Who knows? But when I teach on my main podcast, I speak in general terms so that you can apply my coaching to whatever’s going on in your world. But I wanted to take this opportunity to next level my podcast and help you guys next level your business, and I specifically created this series, which is called the Next Level Your Biz series, to dig into some specific things that I teach to the women that I help in business, so that you can next level your business in the next five days. I am showing the hell up, I am bringing you guys the best stuff that I have so prepare yourself. If you allow it, the next five days can blow your mind and help you blow the lid off of your business. So welcome to the Next Level Your Biz series on Soul CEO Podcast. For the next five days, a new episode is going to drop every single day. And I am going to teach the things that I teach in my Mango Magic program, that I’m going to bring to my next level mastermind that just launched, and I’m going to bring them to your headphones or your speakers or wherever you’re listening to this for free through this podcast. So I’m super excited and I cannot wait for you to join me, and please commit to showing up every day. If you are ready to step the hell up with me, I have created a special list of people who will get an email as soon as the episode drops and get a worksheet to go along with every single episode. So if you’re all in like that, I want you to go to lindseymangocoaching.com/ws, as in worksheet. So it’s lindseymangocoaching.com/ws, and enroll so you get on basically my inner circle secret list to get these episodes and to get these worksheets. So I’m so freaking pumped, are you guys ready? Let’s do the damn thing. Let’s take your business up to the next level. So today, I’m going to kind of prepare y’alls minds and take you back to the foundation of you and your business before we jump into some of the tangible things that I’m going to teach you throughout this week. We’re going to get into marketing, we’re going to get into sales, we’re going to get into daily action items and all the things, but you guys know I’m not taking you anywhere until we talk about what’s going on between your ears. 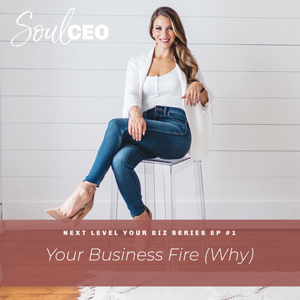 So the first thing that I’m going to talk about is reconnecting back to your heart in your business, back to your why in your business. I have talked about this a little bit on my podcast, but I want to dig into this even more because something that I realized that happens with a lot of my clients who are in business, even with myself, is it gets really easy to get stuck in kind of the day to day of building your business and building the momentum and taking all of these actions and doing all of these things in your business to ultimately get whatever goal or result you’re trying to get. And what happens in the process is we forget why we got into business in the first place. We forget why we’re taking all of these actions. And what I find and what I do for women is first, make sure that they’re in a business that they love, that they’re in something that they’re truly deeply passionate about because I will tell you, if you don’t have that, building a business is going to be a lot harder or look a lot different. But it’s really important to continuously touch base with your heart, tune into your heart, and I promise this isn’t going to get all woo-woo. I’m going to give you guys some tangible stuff. I love woo but I really want you guys to think about your business from a place of emotion, from a place of why you got started in the first place. So I know everybody talks about find your why, find why you do things, and I think that is so valuable. But I think it’s also just as important to be very connected to why you are in business. Not just why for your life. A lot of you guys have kids, have families, you want freedom. Trust me, I am all about freedom. One of the main values and reasons I got into business is because I wanted freedom. But your business, the heart center of your business has to be about something deeper than that. It has to be about a mission, about a purpose, about something that brings you to your knees and tears you up because you love it so much, because I will tell you that continuing to grow in business can be challenging. It can come with roadblocks. It comes with getting through massive fears. And you better love the hell out of your business in order to keep doing that and showing up, otherwise you’re going to burn out. Otherwise you’re not going to be happy. You’re going to get the result that you want and you’re still not going to feel fulfilled. And so the biggest thing with this is first of all, I want you guys to ask yourself this question, “Am I creating the business that I would create if I already had the freedom, the time, the money, and everything I ever wanted?” So I really want you guys to ask yourself that question right now, right here, day one of this series. You might be reevaluating your business, which is amazing. Your business, wherever you are, took you to this point, but I really want to know what’s the thing you would be doing if you already had the results that you wanted? What’s the business you would be creating, that you felt like was your deep purpose and was the thing that you really wanted? For those of you who have a clear answer and who are doing this in business, go you. This is freaking amazing, and remember this. Again, like I said, it gets really easy to get caught up in the drive and the pressure and all the things that come along, whatever you build in your mind around building this business, and I want you to remember this. I want you to remember that you’re doing the thing you would be doing if you already had the result, which is amazing, which means that you’re already fulfilling your purpose, you’re already living the life that you dream of having. Now you just have to stay with it and be consistent and build that momentum to create those exponential results. So that’s the first piece of this. Then I want you to look at what you would be doing in your business if you already had the result that you wanted. So if you already had the clients you wanted, if you already had all the freedom and the income and all of the things, are you building your business the way that you would if you were at that point? So maybe you’re already doing the thing you would be doing, but are you building your business the way you would be? Because if the answer is no, then that means you’re taking specific actions to try to get a certain result that aren’t in alignment with that result already happening. They’re not in alignment with the belief that what you want is already occurring. So take a second to really dig into that. Then I want you to think, next question, and the worksheet is going to walk you through these questions as well. But I really want you to think about what’s my why in my business. Why did I start doing this in the first place? I can tell you guys right now for myself, if I get really focused on my goals and my results, like trust me, I’m goal oriented. I know you guys are who are listening. If I get focused on that, I forget why I got into business and I get really focused on doing all of these things to try and get the result that I want. And when I forget that, it doesn’t matter what I do. But when I go back to thinking about you, like literally, when I go back to thinking about the women and what I envision they’re doing in the world and me helping them and guiding them to get there, that makes me feel like I’m on fire. That makes me feel like I can’t stop. There is no option for me because that is what tears me up. When I hear from my clients that they’re quitting their corporate job, that they have more freedom than they’ve ever had, that they have creating a business when at one point they thought it wasn’t even possible, when I get texts from clients that tell me that they are having their biggest months in business ever, or signed their first client, or hit six figures, I have chills talking about it right now. And I think what is so important is to identify why you got into business. Why is what you are doing in your business your purpose and your mission on this planet? Why are you in this business? And focus on that because that will keep you taking action from a really amazing place. From a place of like, okay I’ve tried 50 things, 49 of them kind of worked, one of them worked for the most part, I got to go back to thinking about these people, why I got into business in the first place and I’ve got to do something else. I’ve got to bring my A game, it’s time to bring my next level. And so I think it’s really important to get clear on that. Get clear on your purpose and your mission and why the hell you’re in business. Think about the people you are serving. The next question is are you offering what you want to be offering. Now, I said before, are you structuring your business the way that you want to structure it. I also want to know, are you offering what you would be offering at the next level? Or are you offering something that you wouldn’t be offering at the next level? I’ll give you guys a great example of this. This is something that I’m going to be teaching in my next level mastermind on a whole new level. I started my coaching business and I took on like, 20 one-on-one clients and that’s how I learned and knew how to impact people and how to build income in business. And I got to a point where I was drained and I loved what I was doing but I was exhausted and I couldn’t serve more people and I felt very stuck by my business. And so I started to ask myself like, is this what I would be offering at the next level? If I was already at the next level, what would my business really look like? And I realized I would be offering programs that could impact masses and could run in the background while I am living my life and creating new ideas for all of you and doing all the things. And so I had to get really uncomfortable. I had to start saying no to one-on-one clients and consults and even events and things that looked like opportunities but were going to block me from really stepping into that next level. And I really had to get clear on what that next level of my business looked like. And the thing is it’s not about waiting. It’s not about structuring your business now in a different way than you would at the next level. It’s about starting to take those actions to create that now in order for you to get there. And it might be really uncomfortable. We’re going to talk about this a little bit later in this podcast series about saying yes and no and how important it is to be really clear on your standards in your business, but it’s a huge part of this as well. So here’s what’s really important about all of this is remember why the hell you started your business. Think about the people that you’re serving. I’m going to give you a very powerful question that you need to go back to over and over and over again. I’m going to give you a question that’s going to snap you back and get you clear on connecting back to your heart and your business over and over and over again and connecting back to your business why, and that’s this. What happens to the person that you are meant to help if you don’t help them? What happens to them? Because I think sometimes people think like, oh, they’ll get help somewhere else, but the reality is that the reason you have this business and this vision on your heart is because you are the person meant to share it with the world, and someone out there will not get what they need unless you show up and tell your story. And this is at every level. This is important to go back to every single day because if you don’t really love what you’re doing in business, if you’re not passionate about it, if it’s not fulfilling you, if it’s not filling you up, why are you in it? You can choose something different. And so I hope that this episode either A, reconnects you back, brings you to tears and really gets you clear on why are you in business so that we can have a really good foundation to build the next layer of this next level for you. Or, helps you evaluate your business and say, wait a minute, is this something I love? Is this what I would be doing if I had everything I already wanted? And maybe change gears and maybe go in a different direction, but that is a beautiful thing because now you’re really pursuing the life and the business that you are dreaming of. Now, there’s one last thing when it comes to connecting to your heart and taking your business to the next level. Are you having fun? I know that sounds so stereotypical, I know that sounds like just – especially if you’re in it, if you’re stuck, if you’re stuck in the grind wherever you are and I’m saying are you having fun, I probably sound like that rah-rah person up on stage like let’s have fun, right? You don’t want to hear it, but here’s the reality. If you aren’t having fun in your business, if you’re not creating things that are fun for you to offer and bring the world, nobody is having fun. Your clients aren’t having fun. Your audience isn’t having fun. The people who are your potential clients are not having fun either, and they’re not going to buy. And so I think the thing is being connected to your heart, being connected to your business why also helps you tap into this place of what would be fun for me to offer. Because I really want you guys to start creating your business and your life from this place of if I won the lottery, yeah, you’d pay off your parents’ home, you’d take your family on trips, you would give money to charity, you would go shopping, you would maybe buy a new house. You would do all these things, but eventually – I’m talking big time lottery – eventually, you’d still have tons of money and you would do all the things that you wanted to do. You are a driven person so you would want to do something, right? Wouldn’t you just create things in your business that were fun? Wouldn’t you be like, what would be exciting for me to offer my audience? What would be fun for me to do on my Instagram story? All of that is so important and I want you to really start to practice looking at your business from the lens of fun. I want you to start looking at your business from a place of what would be fun for me to offer and what would be fun for my audience and my clients? Because that brings a totally different energy. You guys know I’m doing this podcast right here because I thought it would be fun, and I really was thinking like, I was connecting back to you guys and I thought you know what, I think they really need – the business women really want some more tangible business things. So I’m so freaking pumped. Make sure if you want the worksheet, it’s going to be like some journal prompts and some questions for you to work through that goes along with this episode. Go to lindseymangocoaching.com/ws and you will get a worksheet and an email with the podcast every single day this week because we are about to blow your business up in the best way possible, to the next level. So tomorrow we are talking about your daily success behaviors. We’re talking about what you need to be taking action on on a daily basis in your business, a list. We are going to identify – I’m going to teach you guys my specific process to creating that, your to-do list. Then we’re going to talk about selling. We’re going to talk about how to sell without actually selling, and we’ll get into handling objections there. So we’re really getting into some tangible business stuff. Then we’re going to talk about marketing and marketing is something that I am an expert on. It’s something that I’m really good at, it’s something that I love. And I’m going to talk about how to market in a way that connects to your ideal person, that makes it easy to attract them because they want to buy what you’re offering, that makes the process of selling to them easy, and that attracts the people that you want to attract, because that’s what marketing is really about. And then we’re going to talk about building massive momentum in your business and how to do that. So I’m so freaking pumped you’re here. You guys get to hear from me for the next five days and I want you guys to really dig deep on this work and practice implementing it and get out there and take some massive action as a result. So if you’re going to connect back to your heart, if you got really clear on your business why just now, what would you go take action on today? If you were going to go have fun, what would you go take action on today? Go do that. This is how you’re going to get the most from the next five days. I love you guys, I will talk to you soon. Bye.